The first month of shopping, (between Nov-Dec) of course I was Christmas shopping. "Tis' the season to be Jolly!" How fun! I had saved up enough money all year long so that I could have a great time spending it on presents for loved ones. Bringing home bags of new stuff, organizing it on my kitchen table and showing Adam all the great deals I got was becoming a regular hobby. Well now its the 2nd week of January and apparently if you do something enough you become addicted. The first step to recovery is admitting it, right? Here it goes...I have been shopping several times a week for the last few months! Maybe it is the cold weather and spending money gives me something to do? Could it be shopping lightens my mood and makes me feel better? Or maybe its all great perceived sales at stores that make me feel like I am technically making an investment? IDK. After reading "Dennis' Deals" that appear once a week on www.yakangler.com, I thought I might share some things as well. I have found a few items for my lady friends. By blogging about shopping maybe I will shop less...either way I better share this info soon because after today...gotta stop spending money and saving for Christmas 2010. (I have a pair of these and they are great, price wise...this is a steal! I got these for camping and various outdoor activities. FROM UNDERWEAR TO PANTS....they sell a good pair of pants. I have a pair that is comfortable, durable and worth the price. I have literally worn and washed them more than a 100 times and they still rock! FREE SHIPPING ELIGIBLE ON ORDERS OVER $69! The Columbia® Coral Compass women's knee pant is a comfortable and durable pant that brings a feminine touch to the great outdoors. It's crafted using the moisture-wicking Omni-Dry® performance fabric that draws sweat away from the skin to keep you cool and dry. The Omni-Shade® UPF 50 UV protection shields your skin from harmful sun damage. Pants to Tops: I have one of these and they are soooooo comfortable! Be Xtreme! and make your statement. Fitted tees that enhance your look. Small "Live Xtreme!" logo on front. Extra large "Be Xtreme!" logo on back. Live life large in a form fitting, soft and comfortable tee... Available in small, medium, large and xlarge. Colors - black, grey, blue and brown. Made in America and durable. Multiple fibers combine to create the soft texture of this sweater, featuring V-neck styling and classic cabling throughout. Hood and wooden toggles offer a distinctive touch. 55% Ramie/12% acrylic/12% wool/12% nylon/9% cotton. Machine wash. Imported. undies, pants, top....why stop? Here is a good deal for real! 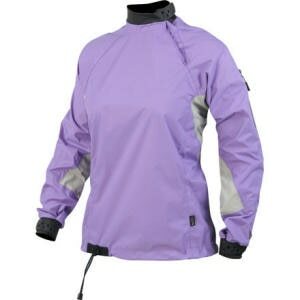 Thanks to fully seam-taped, breathable WaveTex fabric, the NRS Women's Endurance Splash Jacket keeps you from getting soaked by waves, and it reduces the clammy feeling you get with other jackets. Neoprene closures on the neck and wrists ensure this NRS jacket doesn't act as a funnel when waves break overhead. The Endurance Splash Jacket also stops all wind, so you won't feel the chill when you make it back into the raft after an unexpected swim. I think these are cute!